Doctors encourage us to lead a less sedentary life and keep active, but signing up for a new activity — like yoga — can add anxiety. Here, some tips to help you ease your mind. The silver lining to all that medical advice is that yoga promotes physical health in a completely accessible way and it’s never too late in life to start — really! However, starting a new activity can be daunting, especially when it tends to involve younger, energetic students. The first step is to be honest with yourself: where are you, physically? If you’re not active regularly or have preexisting health conditions or injuries, a Yin or Restorative style of practice would be an ideal place to start. So, what does Yin and Restorative mean? “Yin is the application of therapeutic stress to the physical tissues of your body,” Alexander explains. This quiet, meditative class promotes the relaxation of muscles by holding poses for an extended period of time. By letting gravity do the work, each pose lengthens the body’s connective tissues and increases your range of motion, especially in the hips and spine. “But if you have a sprain or any kind of pull or tear, go to Restorative — it’s meant to soothe and ease the body and nervous system,” she adds. “Anyone can go to a Restorative class.” Made up of four or five simple, passive poses that are sometimes held for as long as 10 minutes, Restorative encourages the use of strategically placed props (think: bolsters, blankets, blocks and eye pillows). It promotes the release of the entire musculoskeletal system and teaches students the art of self-soothing. Yin and Restorative help with migraines, osteoporosis and inflammatory bowel disease while also fostering stress management, the reduction of joint pain and an improved sense of balance and mobility. “They’re both intended to bring the nervous system into a relaxed state,” Alexander says. “Yoga affects your muscles, connective tissues, respiration, digestion and both your endocrine and immune systems and it will help them all function more efficiently.” Just make sure your instructor is aware of any preexisting medical conditions. According to a 2009 study published in the journal Spine, two 90-minute yoga sessions per week (for 24 weeks total) saw a 56 percent reduction in discomfort for participants suffering from chronic lower back pain. 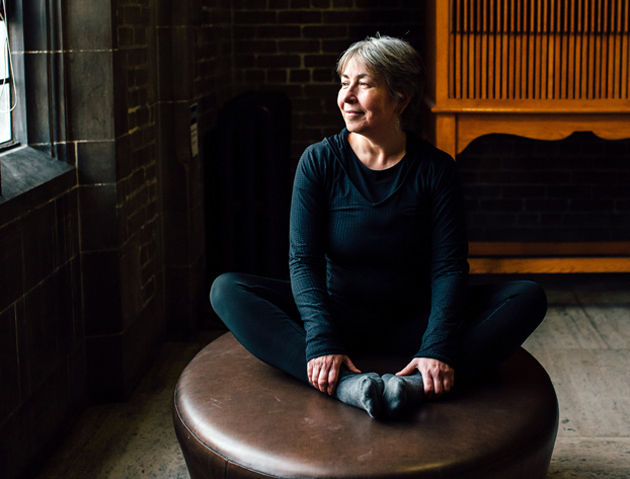 Yoga can also help women tackle the side effects that come with menopause, such as insomnia, constipation, night sweats and mood swings — just make sure you avoid any and all hot yoga classes, according to instructor Ali Alexander. “Your internal temperature is already messed up enough and you don’t want to aggravate it,” she says. “The one thing that exacerbates a hot flash is more heat.” So keep it cool and simple with Yin, Restorative or even Gentle Hatha classes.